Rat anti Mouse dendritic/interdigitating cells antibody, clone MIDC-8 used for the detection of dendritic cells by immunohistochemistry on cryostat sections. Loss of MHC class II expression and bone-marrow-derived stromal cell elements in the thymus of IL-2-/- mice. Frozen sections of thymuses from 5-week-old SPF IL-2+/+ (+/+) and IL-2 -/- (-/-) mice were stained with the anti-macrophage-specific antibodies F4/80 (C and D), and with the anti-thymic dendritic-cell antibody MIDC-8 (E and F). Bound antibody was visualized as described in the legend to Fig. 4. m: medulla; c: cortex. Magnification: 200. 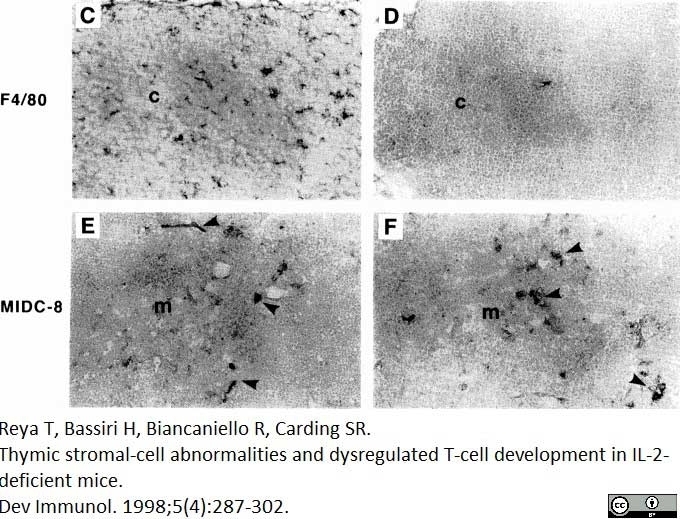 From: Tannishtha R, Bassiri H, Biancaniello, R and Carding R.
Thymic Stromal-Cell Abnormalities and Dysregulated T-Cell Development in IL-2-Deficient Mice,” Developmental Immunology, vol. 5, no. 4, pp. 287-302, 1998. Rat anti Mouse dendritic/interdigitating cells antibody, clone MIDC-8 recognizes an antigen in the cytoplasm of rat dendritic cells as distinct spots near the nucleus. Rat anti Mouse dendritic/interdigitating cells antibody, clone MIDC-8 does not stain thymic epithelial cells which are the major contaminants in thymic dendritic cell preparations. The antigen is also absent in blood cells, bone marrow cells and macrophages isolated from the peritoneal cavity. The antigen recognized by Rat anti Mouse dendritic/interdigitating cells antibody, clone MIDC-8 is found in interdigitating cells in T cell dependent areas of secondary lymphoid organs, the medulla of thymus, veiled cells, and very weakly in Langerhans cells (Breel et al. 1987). Spleen cells from immunized rats were fused with Sp2/0 myeloma cells. Where this antibody has not been tested for use in a particular technique this does not necessarily exclude its use in such procedures. Suggested working dilutions are given as a guide only. It is recommended that the user titrates the antibody for use in their own system using appropriate positive/negative controls. Breel, M. et al. (1987) Dendritic cells of the mouse recognized by two monoclonal antibodies. Eur J Immunol. 17 (11): 1555-9. Schröder, N.W. et al. (2008) Innate immune responses during respiratory tract infection with a bacterial pathogen induce allergic airway sensitization. J Allergy Clin Immunol. 122: 595-602.e5. Bobryshev, Y.V. et al. (2001) Evidence that dendritic cells infiltrate atherosclerotic lesions in apolipoprotein E-deficient mice. Serafini, B. et al. (2000) Intracerebral recruitment and maturation of dendritic cells in the onset and progression of experimental autoimmune encephalomyelitis. Am J Pathol. 157: 1991-2002. Schulte, D.J. et al. (2009) Involvement of innate and adaptive immunity in a murine model of coronary arteritis mimicking Kawasaki disease. Stichel, C.C. and Luebbert, H. (2007) Inflammatory processes in the aging mouse brain: participation of dendritic cells and T-cells. Rezzani, R. et al (2003) Cyclosporine-A treatment inhibits the expression of metabotropic glutamate receptors in rat thymus. Martins, V.C. et al. (2008) Ltbetar signaling does not regulate Aire-dependent transcripts in medullary thymic epithelial cells. Taraban, V.Y. et al. (2008) Invariant NKT cells promote CD8+ cytotoxic T cell responses by inducing CD70 expression on dendritic cells. Shimada, A. et al. (2006) Translocation pathway of the intratracheally instilled ultrafine particles from the lung into the blood circulation in the mouse. Martino, M.C. et al. (2005) Mucosal lymphoid infiltrate dominates colonic pathological changes in murine experimental shigellosis. J Infect Dis. 192: 136-48. Stepkowski, S.M. et al. (2006) Immature syngeneic dendritic cells potentiate tolerance to pancreatic islet allografts depleted of donor dendritic cells in microgravity culture condition. Anderson, K.L. et al. (2000) Transcription factor PU.1 is necessary for development of thymic and myeloid progenitor-derived dendritic cells. Columba-Cabezas, S. et al. (2003) Lymphoid chemokines CCL19 and CCL21 are expressed in the central nervous system during experimental autoimmune encephalomyelitis: implications for the maintenance of chronic neuroinflammation. Sorrentino, R. et al. (2015) A single infection with Chlamydia pneumoniae is sufficient to exacerbate atherosclerosis in ApoE deficient mice. Zhao, X. et al. (2012) A combination of secondhand cigarette smoke and Chlamydia pneumoniae accelerates atherosclerosis. Takakura I et al. (2011) Orally administered prion protein is incorporated by m cells and spreads into lymphoid tissues with macrophages in prion protein knockout mice. Am J Pathol. 179 (3): 1301-9.